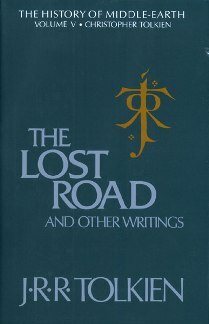 The Lost Road and Other Writings was published in 1987 as the fifth volume in the twelve volume History of Middle Earth series, consisting of the previously unpublished writings of JRR Tolkien, edited by Christopher Tolkien. The Lost Road and Other Writings consists of the “Early Silmarillion” narrative up to late 1937-early 1938, at which point Tolkien set those writings aside for many years during WWII and the writing of The Lord of the Rings. “The Downfall of Númenor” and “The Lost Road” are related texts, dealing with the “mythology” of Númenor, and tying that mythology in with the larger mythologies of Middle Earth and Valinor. “The Fall of Númenor” is a very brief and hastily scratched text with many revisions, one of the earliest works integrating Tolkien’s love of the myths of Atlantis with his previously-created mythologies and essentially creating the “Second Age” of Middle Earth. “The Lost Road” famously came about because of a discussion between Tolkien and friend CS Lewis, in which both bemoaned the state of contemporary fiction. “The Lost Road”, however, also attempts to place the legend in the annals of the history of Europe, presenting the tales of Númenor as a time-travel tale. But after a couple of introductory chapters introducing two characters from medieval Europe and tying them vaguely to Númenor, the narrative falters and goes no further. Tolkien also wrote a chapter forming what would have been a later part of the tale, introducing Elendil and Herendil, a father and son who foresee the destruction of Númenor and the evil influence of Sauron upon the isle’s King. This section contains Tolkien’s final pre-Lord of the Rings writings on the earlier tales. It is an attempt to set in order the earlier mythologies, and includes “The Later Annals of Valinor”, a text giving an overview of the “Valian Years” (those years of the world’s shaping and the awakening of the Elves) and a year-by-year account of the major events of the First Age. Also appearing in this volume is the “Ainulindalë”, Tolkien’s first major rewriting of “The Music of the Ainur” which he had originally written between 1918-1920. This earlier draft had been published in The Book of Lost Tales, Part One. The largest section of the book is comprised of the “Quenta Silmarillion”, a tale on which Tolkien had worked extensively. In fact, it was the “Quenta Silmarillion” that he had submitted to Allen & Unwin in 1937 when they had requested “another book about hobbits”. It proved unsuitable for that purpose, of course. It was too weighted with names, history, and complexity to serve as a sequel to the lighthearted The Hobbit. But this was the point that the “Quenta Silmarillion”, laying out the long history of Middle Earth, had reached. Tolkien himself, the consummate reviser, had submitted it to publication. The manuscript underwent another extensive set of revisions many years later, after LotR was finished, but the version appearing in The Lost Road is as it appeared in 1937, when it was laid aside for more than a decade. Also included in The Lost Road and Other Writings is a wealth of linguistic information referring to the languages of the elves. “The Lhammas” or “Account of Tongues” details the development and evolution of the elven languages and their offshoots. Included here are several ‘trees’ or ‘flow charts’ illustrating the growth and development of the various languages of Middle Earth and Valinor, all stemming of course from ‘Valarin’, the language of the Valar. Also included in this volume is a good deal of information on “Etymologies”, and the definitions of many of the “root” words that appear amongst the invented languages. The Lost Road and Other Writings is the final volume of “The Early Silmarillion” and take us up to the point at which Professor Tolkien began the long and slow journey through The Lord of the Rings, which would consume him for the next twelve plus years. The next four volume in The History of Middle Earth are known as “The History of the Lord of the Rings, beginning with The Return of the Shadow, and are concerned primarily with the writing and development of that epic tale. The final three volumes address Tolkien’s return to the “Silmarillion mythologies” after his completion of the Lord of the Rings.